It seems as though it’s the bane of the artist’s existence, or at least this wildlife artist’s existence…what to paint next, when to paint it, where does the inspiration come from? I can recall a scene from a movie about Jackson Pollock where he sat for weeks in his studio staring at a very, very large canvas, day and night….just staring at this large vacant space. Only an artist, writer, or composer knows the true depths of what Pollock was feeling or thinking during that time. The shaping and reshaping of ethereal images and directions, trying to come to an final image that speaks to you emotionally and has an exit strategy, allowing one to know when it’s time to stop painting. In my case inspiration can happen in a myriad of ways…it may happen instantaneously, or it might take days, weeks, or even months sifting through an idea, to finally come to a point where I’m actually painting. Even when I’m in the movies I’m looking at the composition of the images on the screen, high horizon, low horizon, whether the subject is front lit, back lit….always searching for that inspiration, where ever it might be…. It can be very frustrating….until it happens, then it can be exhilarating. Following my earlier post, actually the schedule and content for my next wildlife painting has somewhat been decided…. 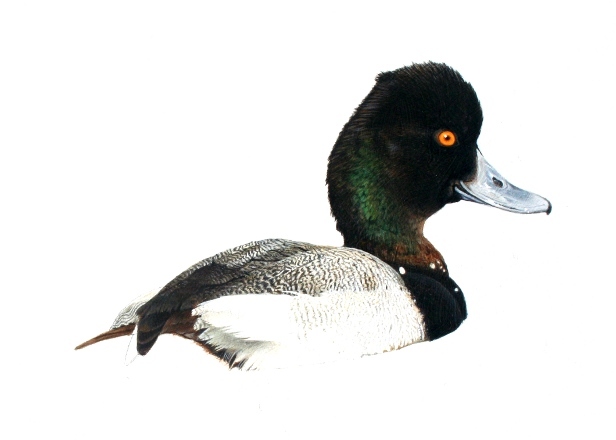 for once again, it’s the time to of year to start thinking of my entry for the Federal Duck Stamp Contest. Although the entry doesn’t have to be post marked until August 15, I always start well ahead of that juncture and now is about that time. Every year five species are designated as the sole subject matters for that Contest and the participating artists has to choose which to paint between those species. This year’s selection (2011 contest) are the Blue Winged Teal, Cinnamon Teal, Gadwall, Mallard and Wood Duck. Even though the finished art is small (7” X 10”), it still requires a substantial amount of reference and leg work to make certain that all elements of the piece are authentic and as they should be for the species that you choose to paint….the competition is stiff, as well it should be for any federal contest and it’s always interesting to see what other wildlife artist present. 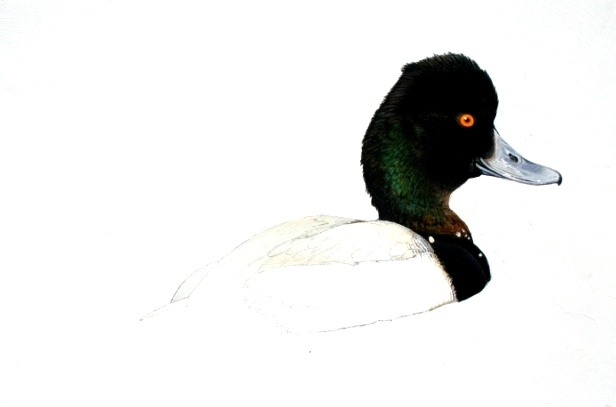 As for the moment, I still haven’t decided which of the species I’ll paint, although either one of the Teals or the Gadwall probably interest me moore that the Wood Duck, or the Mallard which have both been painted extensively….In a later post I’ll mention which species I’ll be painting. In the interim since my last posting, I’ve been going through my normal processes of shooting reference images, scanning through reference books and sketching roughs of out ideas for potential paintings…I’ve been working a number of directions such as, a Killdeer displaying, a deer mouse nesting in an old brass oil lamp, a house wren on an old, ornate, iron fence, or a very cool bird house that I photographed in Creede Colorado a few summers ago…All that being said, I’m still mulling over which to do, I’ve even gone as far as to prepared some boards with gesso that would accommodate the first two ideas, with one being a long horizontal layout and the other more square in nature…..that’s generally indicative that I’ll be painting very soon. It’s also time for me to think of the annual pilgrimage to the high country of Colorado, this year it will take place on June 16…..and I’ve already started to amass the various supplies and materials that I’ll need throughout the three months in the mountains…..So far my cache of stores is comprised of two digital cameras, battery chargers and some binoculars….within the next few weeks that list will grow substantially….. Yesterday, I spent most of the day proofing my latest painting, “The Tapaderos and the Barn Swallow”, at Century Editions, they’re located in North Scottsdale and provide me with my giclees and I’m expecting to have some stock in hand to start filling orders by this week end, a chore I want to have completed before the trip up to Colorado on the 16th…. Speaking of the Colorado trip, this year there’s going to be a new member to the party, a young, mischievous, playful, Rat Terrier mix, named “Snickers”…..At this juncture, He’s somewhat filling the void left by “Barney”, who seemingly had always been with us as a friend, hiking buddy and constant companion. After gracing this planet for more than 17 years with his gentle demeanor, we finally had to come to terms with having to have Barney put to sleep about a month ago. As with most dog owners, they feel their pets are the “greatest”….in our case Barney was all that and more, a wonderful friend and companion…..So, along with Snickers, we’re taking Barney’s ashes up to spread on a high mountain bluff, a postcard like vista where he had wandered countless times, his nose affixed to the ground, a place where his heart was the fullest and he seemed to love the most……Time, as we all know, moves inexorably on, accordingly there will be a new pages written of our trips to the high country of Colorado…..and as sad as it will be to have lost our old, beloved friend, it’s comforting to think these new chapters may begin with some “Snickers”…. Both Barney and Snickers were retrieved from shelters as rescue dogs….To that end, if you’re in the market for a pet, please know, they have many,many, wonderful animals available for homes and the cost is minimal for all of the love and affection you receive in return, plus, you’d be saving an animal in the process ….. In our case, Snickers, even came with a limp (at no extra charge)… it appears that earlier in life he was somehow injured. 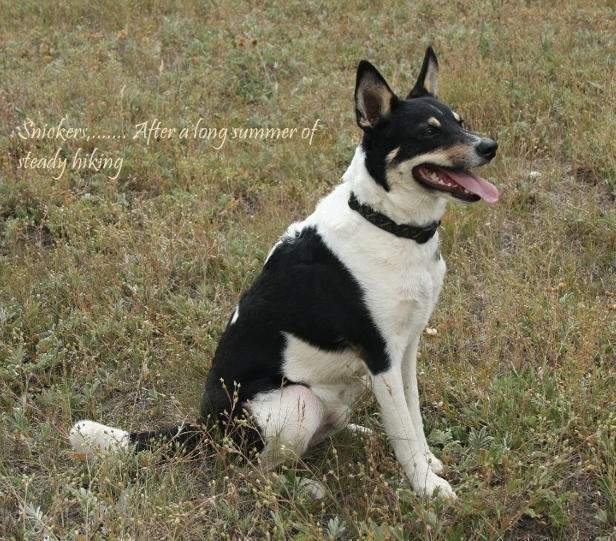 The Vet surmised he may have been dropped as a pup and fractured his knee joint…an infirmity that he’ll carry the rest of his life…………we don’t even notice it anymore…….. 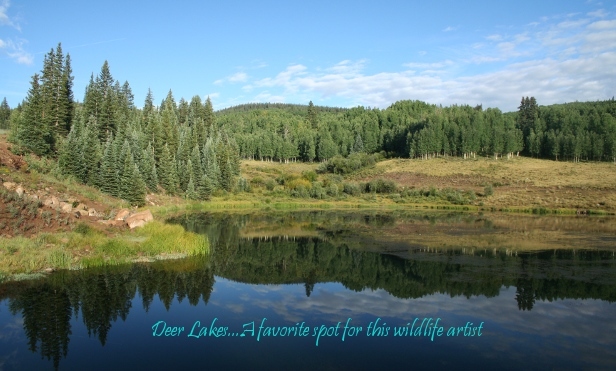 Myself, I eagerly look forward to these summer trips, wherein, I find great inspiration in the high country, it provides countless backdrops, visions of potential canvases, photo reference and the ability to see creatures as they truly are, in their habitat. Not too surprisingly, I’ve found that if you start to study wildlife artists and their locales, in most cases you’ll find that those with the most prominence and greatest bodies of work, have chosen to live in the environment in which they paint, nature, the wilds…….To that end, I’m trying my best to catch up……. Ahhhh yes….the summer breezes are wafting down the avenues and boulevards of Scottsdale and the central AC is now producing a steady hum of cool air to deal with the ever increasing 100 degree temperatures…. 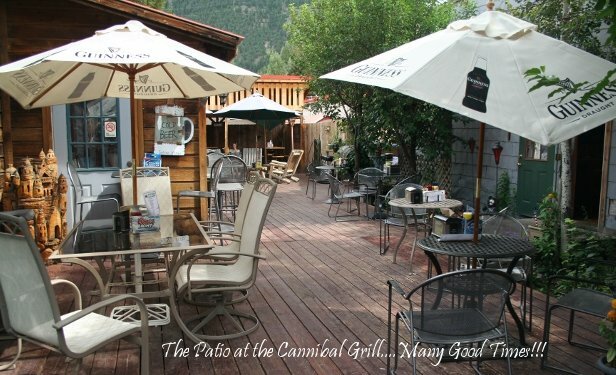 The 16th departure date for Colorado is just around the corner and in the early morning hours of same, we’ll be rolling out of the Valley, starting on what I hope will be an uneventful 10 ½ – 11 hour drive up to the high country. In calling ahead to Lake City’s social, media and weather center also known as, “ The Blue Spruce Lumber Yard”. I was told that the recent temperatures were ranging from 40’s in the evening, to 60’s – 70’s during the day…… just about perfect when thinking of what we’re about to leave. Thinking of the drive,….. hopefully the large forest fire that’s been in the headlines, located in the Northwestern portion of the state will have been brought under control by then. Although the fire isn’t anywhere near our route, that area of the rim country is still visible on a portion of the trip and is so spectacular it would be more than disheartening to see it still blanketed in flames and smoke…. In Colorado the problems are diametrically opposed to that of fire hazards, they’ve just been through a very severe winter, offering huge amount of snow….so they’re on the other end of the spectrum, worried about flooding from the snowmelt….The Cliff House, our Colorado hide-away, is cantilevered off of the side of a mountain and although the Gunnison river is less than a few hundred yards away, most of that is downhill so thankfully flooding won’t pose a direct problem…other than hindering the possibly in accessing other humanity found in the haunts of Lake City. We’ve been in Colorado for nearly a week now, after the 11 hour drive up from Scottsdale. We gladly left behind the 100 degree temperatures in Arizona, for the extraordinarily pleasant 70 degree days here in the mountains. Although we did have a short cold snap for a few days and Tuesday of this week we awoke to the mountains having a nice dusting of snow, of which this area had more than their normal amounts of this past winter. To the extent that the San Juan Solstice, a 50 mile run that starts in Lake City and traverses through the mountains, had to be re-routed this year due to the streams swollen with snow melt and the remaining snow fields that covered most of the course in the upper elevations (11,000-12,000+ ft.)…. FYI, the record for that event running fifty miles, all above 9,000ft is 8:42 minutes…which I couldn’t do in a jeep! 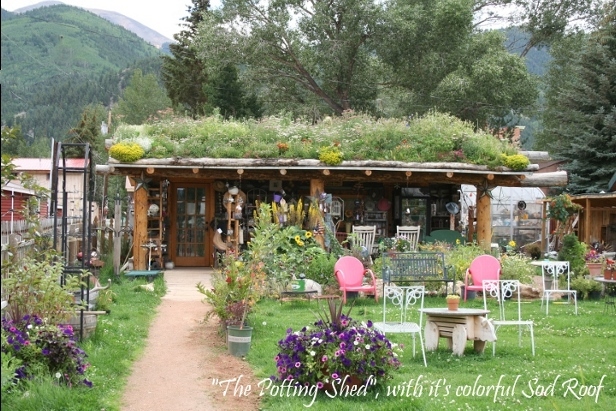 That aside, the cabin is now back in order, un-winterized, cleaned and stocked, plus all of the cartons that were shipped from Scottsdale have arrived (clothes, art supplies, miscellaneous) and my new studio, here in the cabin, is steadily being organized. In the interim, I’ve been doing a lot of sketching, reference photography, as well as some quick acrylic studies of landscapes with early morning and late afternoon lighting…..but, now that my studio set-up is complete I can begin to paint in earnest…. 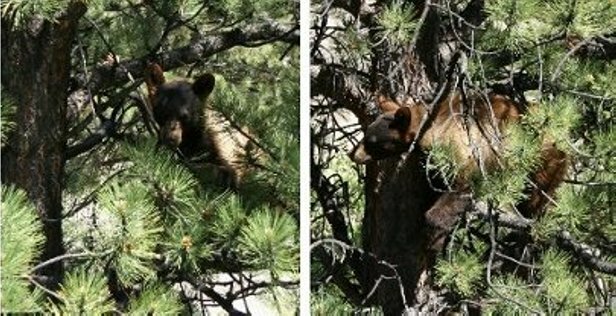 Joyfully the sounds of distant fireworks have finally subsided and the seemingly endless flow of holiday traffic will clear from Colorado Rte 149 as quickly as it appeared ….. thus allowing the inhabitants of this serene enclave, to make a blissful return to normalcy. Insofar as my wildlife art, my latest piece (which popped into my consciousness while I was hiking and saw an old section of pasture fencing) is a long narrow horizontal layout of a young, fledgling Barn Swallow, with tuffs of down still attached, resting on a length of barbed wire with some crimson/orange blossoms of Indian Paint Brush balancing out the scene…….Plus, not unlike other artists, or wild life artists, I may lack the discipline to deal with some of the more pressing scheduling items ( such as the Federal Duck Stamp Contest deadline) and tend to want to just be painting, instead of being stuck at Top-Dead-Center, while mentally thrashing around trying to find the perfect reference and layout for an entry…So, I continue to paint on the unscheduled piece of art , while I ruminate on the potentialities of a scheduled item….not an unfamiliar milieu for this wildlife artist. Those issues aside, as per the norm, we’ve been hiking the nearby mountains on a regular basis and our new dog Snickers has steadily grown from a neophyte to the sounds and scents of the high country trails, to one who is now an eager participant….and while trekking, when the rest of us our gasping for breath in the rarified air of the upper altitudes, Snickers finds it to be more pleasurable with a large stick, or limb in his mouth that he will carry for the entire time, bringing it back into the cabin like some badge or medal he gained from the hike, never the worse for wear. 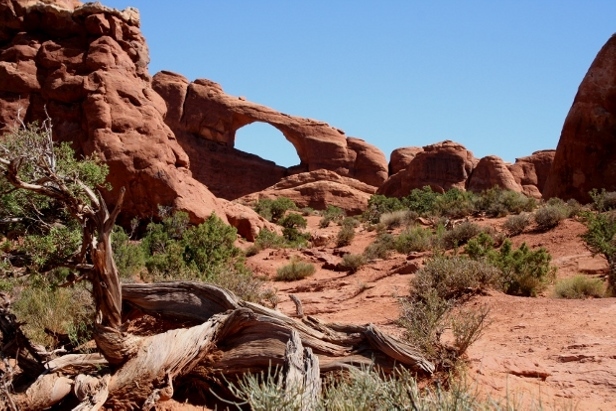 This past week found us travelling out of Colorado and into Utah for a three day trip through Moab (Arches National Park) and Salt Lake City. In my travels around the world, this wildlife artist has seen a lot, but the West River Canyon pleasantly ranked as one of the most spectacular sights I’ve ever encountered, it’s vertical, multi colored, red walls, etched through wind erosion, are sporadically covered with dark splotches known as “desert varnish”, or an even darker strata that the geologists refer to as “Vishnu Schist”…all of which glistened under a fresh glaze of pouring rain. As the vistas opened and closed, it seemed as though there were paintings at every turn that just that begged to be painted…..Also abundant, were numerous “run off waterfalls”, freshly formed from the rain, short lived geysers, dropping hundreds of feet onto the rocks, or into the Colorado river, just spectacular……This area is a rafting and kayaking center and even in the rain and storm the river was dotted with various types of crafts heading swiftly downstream to many pick-up points further down the canyon…..The rain was gone as abruptly as it came… and we were driving in sunshine as we left the walls of the canyon and turned onto the highway and entered the outskirts of greater Moab. 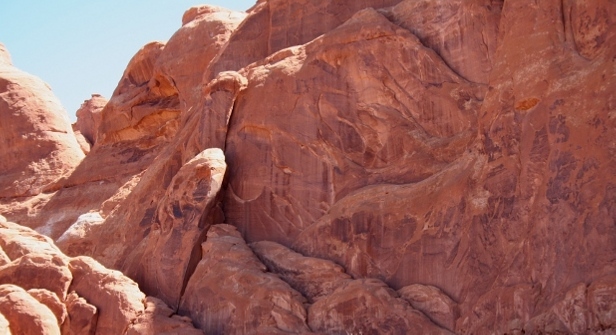 Moab, the “Slick Rock Riding Capital of the World”, Mountain Bike Mecca, acknowledged cycling purists Xanadu, etc, etc…. 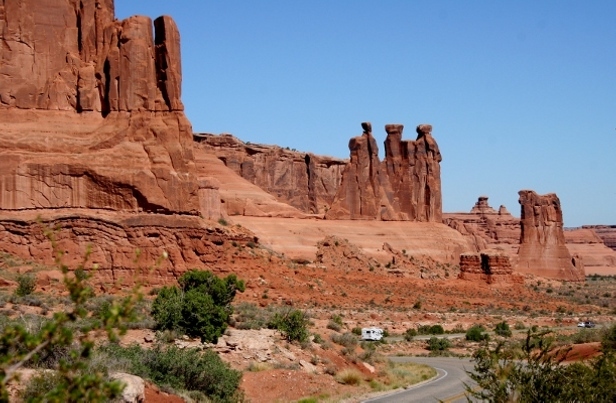 In tacit support of those claims to fame, nearly every vehicle in Moab has a bike attached on it somewhere and most lodgings are “bike friendly”, with bike service racks and wash areas as commonplace as neon signs . We had made reservations at a funky, but very, very nice, “pet friendly” place called the “Gonzo Inn” and as offbeat as the name might seem, it was quite comfortable, modestly upscale, with a great continental breakfast….for anyone venturing to Moab, you should check it out, we recommend it highly. 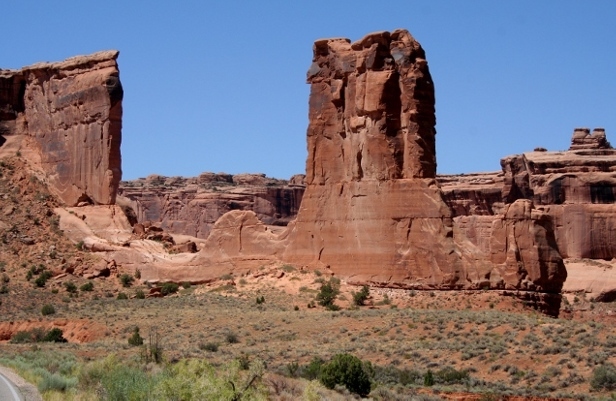 On an aside, Moab is also known as the “Uranium Capital of the World”, in part that title is evidenced by the large mining operation north of town where one can see an endless line of orecars lined along a railroad siding, sliced into the escarpment of an adjacent mountain. If you’ve never been, The Arches National Park is phenomenal…the scenery is such that I’ve never seen before and although the park’s namesake is its arches, I found the monolithic vertical slabs of red sandstone that rise hundreds of feet into the air to have been my favorites….with names such as, “Park Avenue” ,” The Tower of Babel”….I found myself taking far more digital shots of these formations than the more famous arches…..as well as the vertical slabs and arches, there’s an abundance of wind that’s a continuum in the park area and most of the trees and shrubs are twisted into contorted shapes…. I could have easily spent several days at the park, with easel and brushes in hand, it’s just that magical…but, timing was an issue so we set out for Salt Lake City after a half day in the park area…. In the past three weeks, since my last posting, life has remained peaceful and serene in the high country… with the exception being that we’ve only had to confront a few new entities in our midst … those being, a new posting by the Colorado Division of Wildlife, that there are Mountain Lions active in the immediate area and more notably for myself a nasty onset of diverticulitis, that seemingly wants to take up permanent residence in my lower abdominal area. 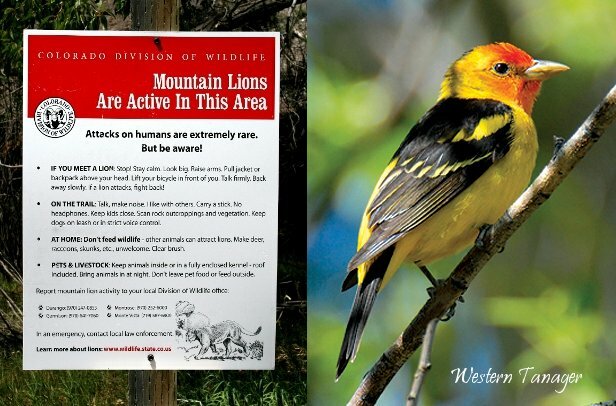 Insofar as the big cats, opposed to a face to face encounter I had with an adult mountain Lion three years ago while fly fishing on a scenic mountain stream known as “Big Blue”, we haven’t seen any obvious signs of big cats near the cabin. On only one occasion, about a week ago when I was gingerly taking Snickers for a late afternoon walk up on the “Bluff trail”, I noticed that the Magpies were noisily chastising something in the brush on a slope above the trail….then there was some movement and a large critter of some sort was stealthily moving up and away from us…I’ve never heard magpies give any indication of Bear, Deer, elk so I can only assume it was something other than that grouping…. Oops, just one last medically slanted thought, if there‘s any solace to gained from being ill in this community, it’s that Lake City has a beautiful, brand new, medical center that’s incredibly staffed by volunteers and a local physician and his wife who is an RN…..it’s a uniquely interesting feeling to have a young aid drawing my blood (very expertly I might add), when only a few weeks before that the same young woman was serving us a cocktails local grill…. So, I can personally attest to their competence and expertise and the fact that all of their medical equipment functions as it should, sans the Helicopter which transports more serious medical patients to Gunnison or Grand Junction…in that instance I was glad that I didn’t have the experience. Also while convalescing, I would take brief stints of sitting on the deck, soaking in a little sunlight and fresh air… and on more than one occasion I was been visited by a curious male Western Tanager who would perch in a nearby pine or hop along the railing of our deck, cocking his head from one side to another while checking me out as I was doing the same to him. This species is one of the high county’s more spectacular birds and as colorful as they are when you see one perched in a tree or shrub they literally explode in brilliance when they’re in flight. In total, at least from the standpoint of my creative endeavors, this summer was very much a non-plus….wherein my continuing dance with diverticulitis wouldn’t allow for much time to be spent at the easel, thus little or no productivity was gained painting western art, wildlife art, or any other subject matter. That aside, I was still able to do some modest on-site sketching and a considerable amount travelling around spots “nearby” to Lake City, taking reference photography which will serve me well when I finally get back to being a painter…such as that is. 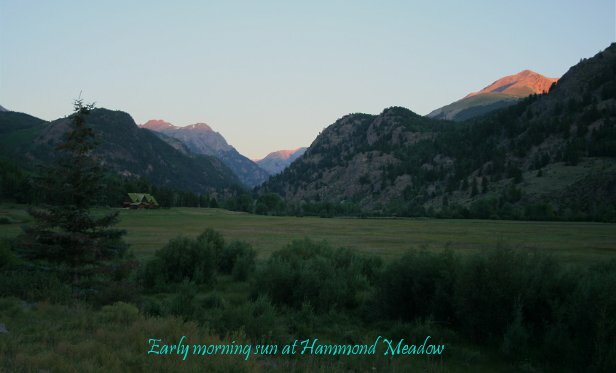 At a bare minimum, my wanderings allowed me to acquaint myself with some of the more scenic locales, along with a few critters that I hadn’t been exposed to until my convalescing travels this summer….I visited Hammond Meadow, in earlier times an Inn and Stage coach stop for travelers in route over Cinnamon Pass to Silverton. 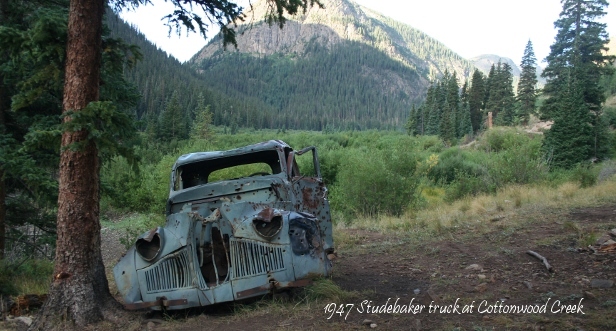 Or Sherman, an old mining town incorporated in 1887 that’s found south of Lake City on the way to Cottonwood Creek, (where if you get far enough back on the “road”, you’ll eventually be greeted by a wonderful, old, bullet ridden shell, of a 1947 Studebaker pick-up truck)…or continuing on that road a little further you’ll get to the end of what could be considered any passable vehicular trail, at a place called Cuba Gulch….where you can still catch glimpses of the what would be the pristine Colorado the past…As well there’s Capital City, so named because it was once proposed as a site for Colorado’s capital…..all scenic vistas and venues, any one of which inspiring enough to be a subject matter for a future painting. Another place where I spent more than a little time this summer, one that isn’t as remote as some of the other locales I’ve mentioned, yet it maintains its own level of distinction, a high mountain area known as Deer Lakes. 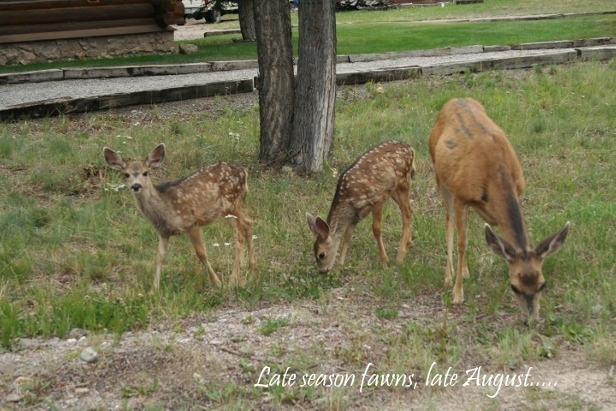 Located about ten miles and a few thousand feet in altitude above Lake City, Deer lakes is on a narrow dirt road which intersects Rte 149 as it cuts over Slumgullion Pass….This is the place one goes if they’d like to have a greater opportunity to interact with a species whose biological name is “Alces alces”, more commonly known as the North American Moose. Uniquely,the Moose in this area are somewhat smaller than the Moose of the Northeast and far Northwest, they’re all part of a core herd that was re-introduced near Spring Creek Pass in Hinsdale County few years back… today they continue to grow in numbers and have achieved a rough population of approximately 50-60 animals. 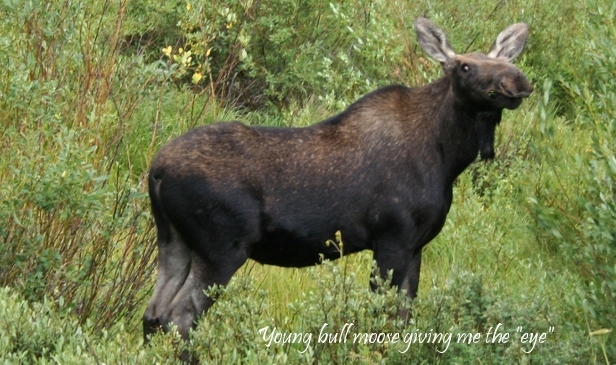 In my Moose seeking endeavor, I spent the better part of a week, canvassing the Deer Lakes area trying to catch a glimpse of a bonifide Alces alces,….. Then, late one afternoon we finally spotted a dark speck which turned out to be a cow (thru binoculars) browsing in a distant, mountain side drainage… I wanted to get closer to take some pictures and after looking for a while, I found an old logging/camp road that penetrated the woods well above her position and was passable enough to get me in a more accessible route to her. From there I hiked, slogged, down through the willows and bogs eventually ending up at about 50 yards upwind from where she was browsing…..Shortly thereafter she realized I was watching her and she started to slowly move away and it was at that time I noticed that she was hobbled with an injured rear leg…..So, not wanting to spook her where she might try to run, I quietly backed away with just a few distant digital images to document our chance encounter. Then, the next day, during a steady rain shower and only a short distance from where we had seen the injured female, we happened upon a young, much healthier, sub adult bull moose, gamboling in the rain, tossing his head and kicking his rear hooves up like a young pony… opposed to their normally quiet slow deameanor, this youngster was running headlong, dashing across an open glade in the forest. Finally, after plowing through the willows next to the road, he came to a large beaver pond, where he continued splashing and throwing water with his head…then, for reasons known only to himself, he almost immediately became more mooselike and started to browse on some nearby willows and even though he eyed me repeatedly, he allowed me to approach to within some twenty feet and snap some great shots, (personal opinion coming into play here) capturing the sheer physical presence and radiating personality of this fascinating animal…. 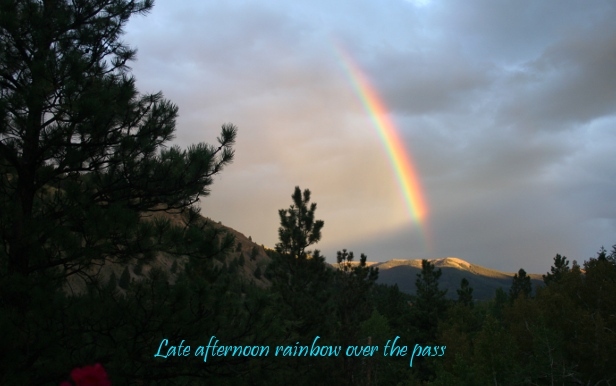 October 8, 2011 – I’m Back in the Saddle again……or better put, the Studio again…. Finally I’m back to work and feeling better with the “diverticulitis word” hopefully being a part of the vernacular of the past. 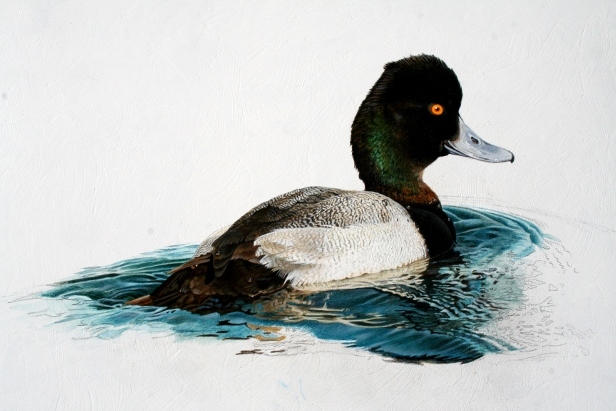 Insofar as my creative efforts, I’ve started working on a medium sized painting of a Greater Scaup, when finished it will depict the bird leaving a wake as it swims through some calm, reflective water….I’m gauging about three weeks of effort in front of me. This is where we are at the moment with this piece…..nothing firm here, just a notion of time…. 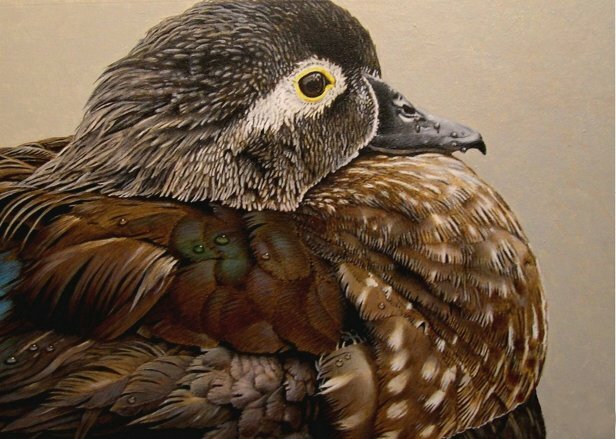 The Society of Animal Artists 51st Annual Exhibition opened in Traverse City Michigan and I was fortunate enough to have my painting of a female wood duck, entitled, “The Mind is Shore less and Still” juried into the show. From what I’ve seen (from images posted of some of the entries it’s a fabulous show, one that I’m humbled and flattered to be a part of). I was notified that my painting will be part of the “Western Tour” of the exhibition, which is broken into two segments, an Eastern and a Western Tour that will traverse the United States For the remainder of 2011 and most of 2012. The Stops for the Western Tour are: The Wildlife Experience, Parker, CO November 19, 2011 – February 19, 2012; Dunnegan Gallery of Art, Bolivar, MO March 15, 2012 – April 15, 2012; Milwaukee Public Museum, Milwaukee, WI, May 26, 2012 – September 3, 2012…. So, if you happen to be in the vicinity of any of these Galleries or Museums, please stop in and see the show, if you enjoy wildlife art (or art in general) you’ll be thrilled with what you’ll see. 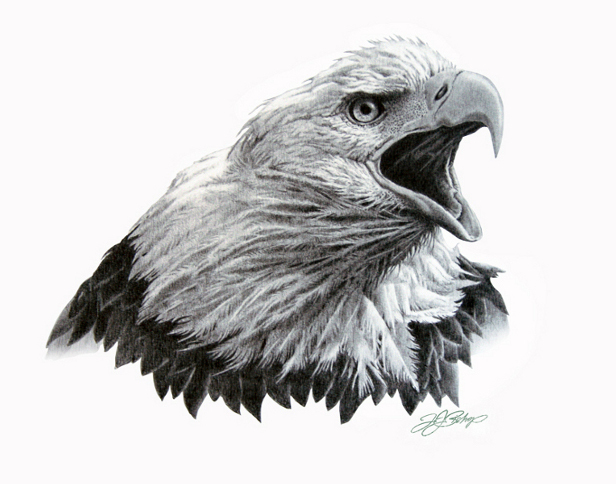 Additionally, I was just notified by mail, that one of my graphite sketches “The Bald Eagle – Head Study” was accepted into the Mountain Oyster Club Show in Tucson, Arizona. The show, which is always a great event, takes place from November 21, 2011 thru following February….There will be 300-400 artists represented from across the United States, all of the work goes through the jurying process and I’m grateful to have been accepted….I’ll take some shots and post them on my blog after the artist’s reception for show. Also, in order to give this wildlife artist some productive breaks from the studio, I’m going to be doing some Plein Air painting on a weekly, or by weekly basis. I’ve acquired a Julian “Half Box” Easel (picked this particular one up because I got a fabulous deal on it on Craigslist) and have outfitted it with the necessary accessories and now that the temperatures have broken, I’ll be doing some on-site painting in and around Old Town Scottsdale as well as taking some day trips out into the desert & up to the north to the rim country. In contemplating doing plein air, I’ve talked to a number of artists and have been given varying viewpoints on which type of easel to use. So, first, I’m going to see how I like this type of easel (my bargain easel), opposed to the more contemporary type that has a plein air, art box that mounts directly onto a camera tri-pod…. Whatever I find to be the preferred direction is what I’ll get for use up in Colorado….I’ve found that having duplicates of everything I need in both places, is preferable to lugging all of my art supplies back and forth… with the exception(s) being, I don’t leave paints, gels, gesso’s, etc., or anything that can freeze in the high country. October 23, 2011 – Also, in order to be an Artist…. 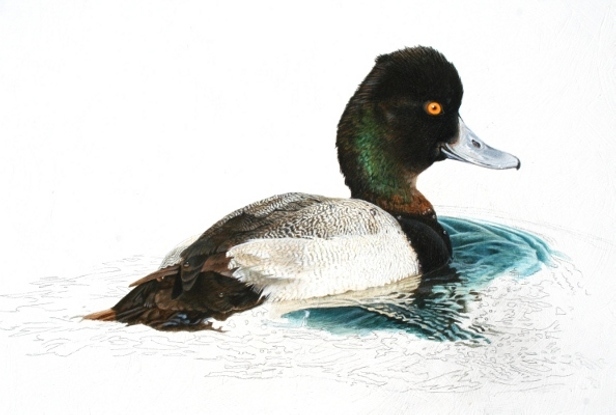 I’ve included a work in progress on the Scaup painting which is actually a 10 days old, but, it’s the only image that I had formatted at this juncture… so there will be much more visual evidence of progress to come on that front in the very near future. Additionally, I accomplished a myriad of non- painting activities since my last posting….I ordered a “true light’ umbrella for my plein air easel, the fabric of the umbrella provides shade without altering the hues and colors being used. l also modified the easel to hold my paints in a “stand up- easy access” fashion, the same as I use in my studio, along with a folding work space that attaches to the front of the easel, to hold my water container and brushes and a roll of paper towels …. So, next week when my umbrella arrives…I’ll be off and painting on location and an additional plus, the temperatures have finally fallen consistently beneath the 100 degree mark….which also means we’re finally getting back to the weather that brings everyone to this part of the world…..
Lastly, I picked the “Bald Eagle Head Study” up from, Framers Workshop in Scottsdale, great folks, who do fabulous work and it will be shipped, or taken down to Tucson, next week. On a networking basis I’ve ramped up my Twitter account I can be found “@desertartist50” and am now following about three hundred various folks , while at the same time being followed by around 100….hopefully granting the wild life artist more exposure, more access to reference and new styles, new directions….exciting stuff. The aforementioned narrative serves to illustrate that for anyone who wishes to be serious about being an artist, you still have to dedicate time and manage numerous other aspects of the business opposed to just that of painting. 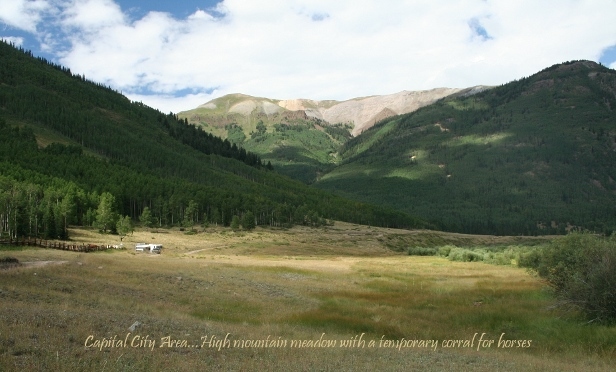 October 26, 2011 – GET READY, GET SET……PLEIN AIR!!!! 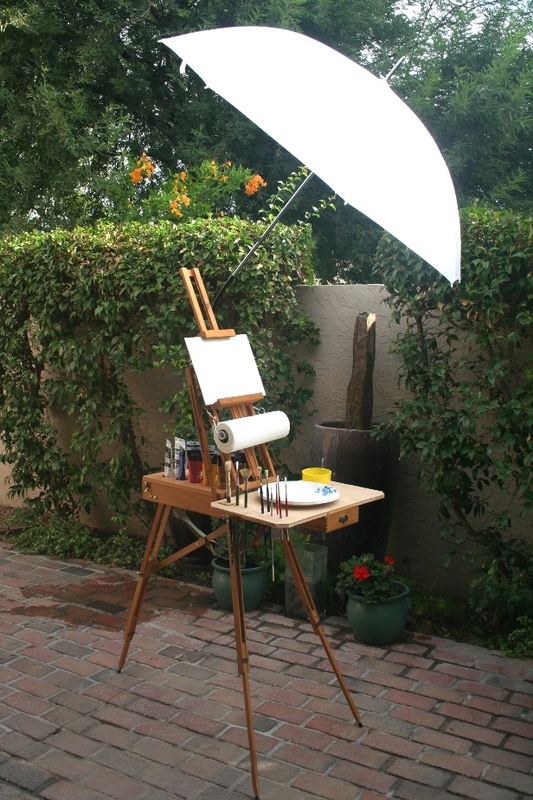 My Plein Air Easel is now complete.. just as pictured…. will be going out within the next few days for some test miles…. 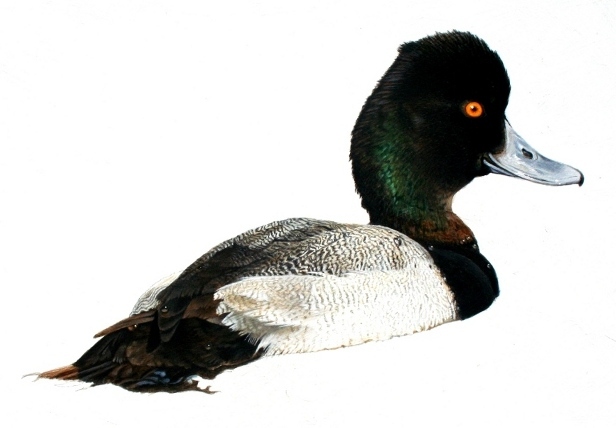 As mentioned I had further update images to post, this one shows the Scaup nearly finished…the irregular shapes near the tail feathers are actually reflections of the water that will ultimately surround the Scaup. More updates later. 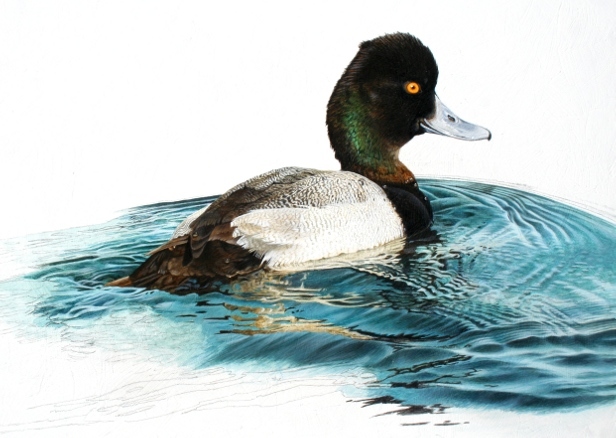 The Scaup, basically is complete…now I’ve started to fill in the water. waves and reflections surrounding bird…the lower portion of the painting will have lots of movement, much in the same fashion as I’ve already painted, while the upper portion of the painting the water is much clamer without as much action and personality. 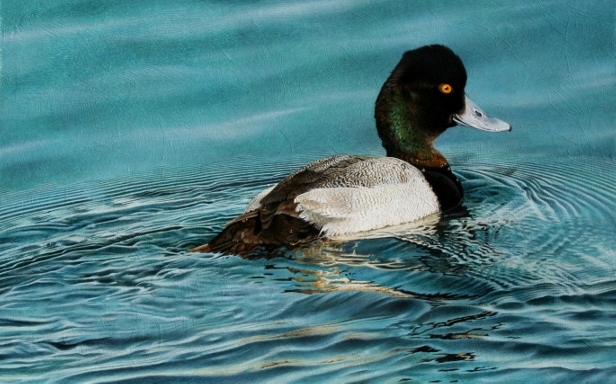 Water, water everywhere… still slowly working my way through the movement and reflections of the water trailing behind and to the sides of the Scaup, it’s slow going while I try to accomplish all of the subtle nuances correctly…Also, I work predominently in glazes which requires that I go over areas numerous times in order to achieve the desired depth of color…then I’ll go back in and add the highlights and surface reflections. The horizontal scope of the painting has now been established, this is as large as the piece will be in that dimension..on the other hand, the vertical dimension will ultimately be a little larger that what is shown in this image. 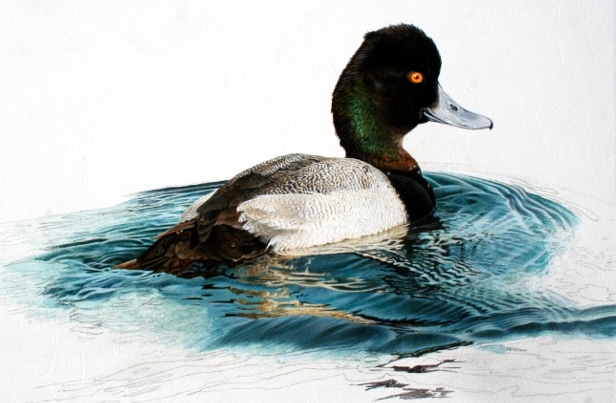 The remaining area to be filled in behind the Scaup in the area of the wake has less movement than the water around it and shouldn’t take that long to complete…Next to be done will be the ever diminishing, wake lines that radiate out from the front and top of the turbulent water…these vanish into the calm water and reflections that will be displayed in the upper portions of the painting that will be done last. 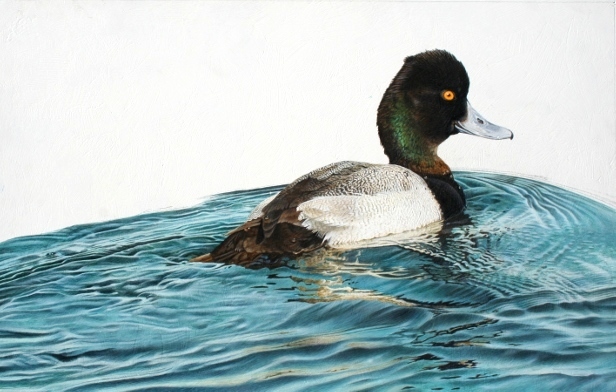 I’ve filled in the remainder of the more turbulent water found in the wake of the Scaup…even though this area is now completely blocked in, I still have some final touches, reflections, movements and details that have to be accomplished. I’ll get back to those in due course, as of the moment, my next order of business will be to indicate the small radiating lines of motion that are found in the water proceeding and on the edges of the wake that’s already in place…. Once those are complete I’ll proceed to block in the calm water that will flesh out the remainder to the painting…. 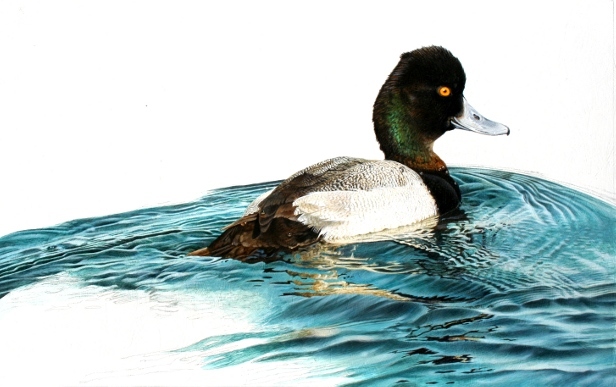 I’ve finished most of the small radiating lines of motion around and on the edges of the wake of the Scaup, I still have some work to do blending these areas into the main body of the painting, yet they’re far enough along to get a good understanding of their final look and feel….As you can see, I’ve started to block in the “calm water” that will comprise the remainder to the painting….This area won’t have near the drama found in the more turbulent water and will be mainly accomplished through a lot of nuanced transitions of value and color….or as it’s better put, tedious blending. I’ve blocked in the majority of will be the calm water that comprises the background of the upper areas of the painting. When selecting a hue for this area, I picked what I considered to be a middle tone, found in the wake portion of the painting as a starting point. This color is more complex than meets the eye, being a mixture of 6 colors; sky blue, ultra marine blue, raw umber, yellow oxide, black and white. I’m constantly mixing batches of this combination, which gives subtle personality changes to this area. Initially, I’m using a cross hatch technique with, that to the eye, is very similar what might be accomplished with the dabbing of a sponge, I just prefer to take a more controlled method. …After attaining a good coverage of pigment through the cross hatch method, I then complete the coat that area with several glazes of to “seal in” the final color. 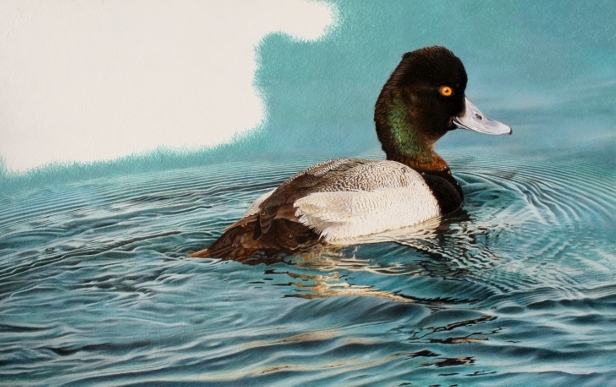 Lastly, In front of the Scaup, you can see that I’ve started to finish the surface of the calm water…which doesn’t have a lot of movement and contrast….. but, is time consuming because of all of the feathering of the light and dark hues on the middle tone color of the background. Taking a break from reporting on my painting and other “artwork stuff”, I have to report that Snickers has arrived at a new station in life. 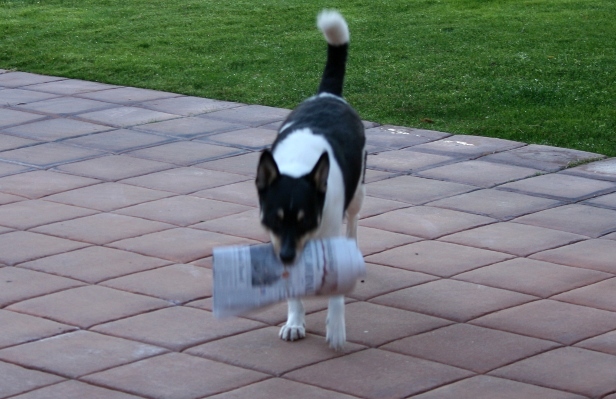 Being the smart little pooch that he is, he has now mastered (with the help of a few doggie treat rewards) the task of bringing in the two morning newspapers, he retrieves The Arizona Republic and The Wall Street Journal, that are delivered very early every day….This newly developed ability surpasses that of merely being another “Snicker’s trick” and becomes a blessing, when on the rare ocassion it is pouring down rain, or too cold (for us Arizonians) to venture out to pick up the news. On those particular days, he gets two doggie treats in payment for his own form of “meritorious duty”. 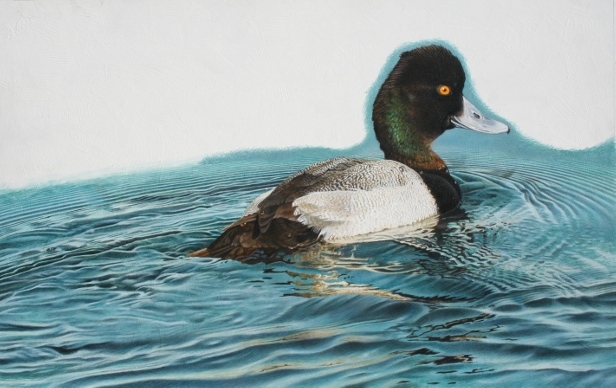 This is the Scaup painting, that I have entitled, “Bluebill”, in it’s final form…. I have completed the level of detail that I wanted in the calm, rolling background water, giving it enough definition so that it reads comfortably with the more detailed, contrasting elements of the wake water and duck. I enhanced the detail found where the tail of the duck contacts the water, this was too generic in form and needed a few additional shapes. The same goes for all of the small radiating lines of the wake (both along the front and sides of the wake). I also re-glazed the front of the duck’s head making certain that it graduated from solid black to lesser shades that incorporated brown and green hues…..at this juncture I’ll still wait a day or two prior to signing and varnishing. Then it will be sent to Century Editions, my giclee source to be photographed and archived, then on to Framers Workshop to be framed.